This section is designed to help participants on Hondoo’s multi-day adventures plan their trip to the Canyonlands. You will receive a trip information packet containing a packing list, detailed itinerary, lodging confirmation and travel instructions upon receipt of reservation. If you have any questions, need help with logistics, or would like to share travel expenses with other trip participants, contact Hondoo or your travel consultant. 1) Grand Junction, Colorado–215 miles. 2) Salt Lake City, Utah–255 miles. 3) St. George, Utah–300 miles. 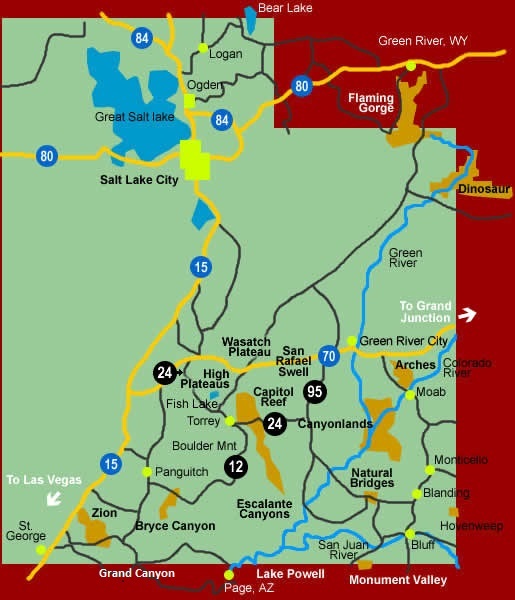 Travelers who elect to drive or fly/drive will begin and end their trip in Torrey, Utah (except Inn-to-Inn Trail rides, see below). Camping trail rides depart and return Torrey, Utah. Inn to Inn trail rides depart Torrey, Utah and end Boulder, Utah. Vehicle tours and hikes depart and end at our headquarters in Torrey, Utah unless otherwise arranged. All Custom trips meet, depart and end as arranged. In addition to some riding experience being required, participants should be in good health and physical condition. While the minimum age of eight years is recommended, the important point you should understand is that Hondoo doesn’t want to put any participant in a situation which they are physically or emotionally unable to handle. An appreciation of the outdoors is the only prerequisite for joining a trip. Hondoo’s horseback trail rides are limited to 10 or 12 participants, depending on destination. Our trips are designed for horse lovers and outdoor enthusiasts. We pride ourselves in giving experienced riders the challenge and pace they desire without abusing the horses, and in giving wilderness seekers the untraveled and scenic back country they relish. Our high guide to guest ratio may allows us to divide into groups by ability and interest when time and logistics allow. It should be noted that although Hondoo’s trips are designed to accommodate hikers as well as riders, if you plan to combine both activities, let Hondoo or your travel consultant know so they may plan for appropriate personnel and horses before the last moment. While tipping is customary, it is always optional and a personal decision on your part, based on your overall experience. A guide is rewarded by the opportunity to show you a beautiful area and to share your vacation with you. However, a financial gesture of appreciation will be well received! If you do choose to pass along a gratuity, it is appropriate to direct it toward the trip leader who is responsible for distribution. The industry standard is 15-20 percent. While hiring a rental car is the most economical way to reach the canyonlands and Torrey, Utah, and public transportation is not an option, we recognize that some guests will require supplemental transportation. Ground transportation may be arranged from Salt Lake City or St. George, Utah after a ground shuttle from the Las Vegas, Nevada airport. Contact Hondoo or your travel consultant for additional information and connecting transportation schedules. Participants on camping rides will meet at 8:00pm on Day 1 in the lobby of the Red Sands Hotel or pool-side at the Chuckwagon Motel. We will have an orientation and final packing session at this time. Meeting and lodging locations will be specified upon reservation confirmation. Lodging your first night is included at the AAA-rated Red Sands Hotel or Chuckwagon Motel. Red Sands Hotel is located on highway 24 on the east side of Torrey. The Chuckwagon Motel is located in downtown Torrey at the junction of Main and Center Streets, one block west of Hondoo’s headquarters. Participants on Inn-to-Inn rides will meet with Hondoo’s staff at 8:00 PM on Day 1 in the Living Room at the Torrey Schoolhouse Bed & Breakfast, the Communal Room at Sky Ridge Inn, or Muley Twist Inn. Your lodging location will be specified upon reservation confirmation. The Torrey Schoolhouse Bed & Breakfast is situated 1 block from Hondoo headquarters on Center St. in Torrey. The Muley Twist Inn is located one mile west of Teasdale, Utah in a secluded rock cove (3 miles west of Torrey). The Sky Ridge Inn is located ridge-top and off-highway one mile east of Torrey, near the junction of highways 12 and 24. Inn Rides end in Boulder, Utah at either Boulder Mountain Lodge or Pole’s Place. The Boulder Mountain Lodge is located on Utah Highway 12 in Boulder, UT. Poles Place is located across from the Anasazi Museum on Highway 12 in Boulder, UT. All other trips meet and depart as arranged. Special Transfers from any location in the Inter-Mountain West may be arranged. The Wayne Wonderland Airport is located seven miles east of Torrey near Bicknell, Utah, and serves private airplanes with a 6,000ft. landing strip which is paved and lighted. Passport and Visa requirement information is available through your consulate. Quality lodging with swimming pools may be found at the Chuckwagon Motel, and Red Sands Hotel in Torrey. Quality service may also be found near Torrey at the Lodge at Red River or Muley Twist Inn, Sky Ridge Inn or the Boulder Mountain Lodge , Boulder, Utah. The key word in this description, as far as weather is concerned, is semi-arid. It is generally dry with most precipitation falling as snow in the winter and occasional thunderstorms during the summer. Higher elevations are cooler and receive more moisture than lower environs. Hondoo’s trips explore the lower, slickrock and pinyon-juniper forested areas on spring and fall trail rides. In the heat of the summer, ponderosa-pine or aspen-spruce forests form the backdrop for experiencing the canyonlands. Trip temperatures rarely exceed 90 degrees daytime or 40 degrees at night. With warm days and cool nights, it is best to layer your clothing to maintain comfort and you should always pack rain gear just in case. Unless otherwise indicated or arranged, the trip ends late afternoon when you return to Torrey. Often the group meets for dinner and spends at least one the last night in town. You may wish to extend your stay in the area and Hondoo or your travel consultant can assist you. See Suggested Arrival Time and Suggested Lodging for more pre and post trip details. Travel Insurance is a good idea and most insurance agents or travel consultants can provide you with a vacation insurance plan that covers accident, baggage, and cancellation claims. While we don’t endorse any particular company, American Express Travel, Travel Guard and Lonely Planet have programs for adventure travel coverage. Although every attempt is made to adhere to itineraries, participants need to acknowledge and willingly accept the possibility of route and itinerary changes due to factors beyond the control of the operator. Mother nature and government land managers have, on rare occasions, thrown us a curveball (i.e. a freak two foot snowfall and camping restrictions due to hazardous fire conditions). Please contact us with any questions regarding the trip. Patricia Kearney or Gary George, interpretive specialists, lead each and every trip. Pat and Gary have been guiding backcountry travelers for over three decades. They are joined a small group of seasoned guides who share a similar interest and enthusiasm for the canyonlands. Utah State sales tax, airfare, rental car, transfer package, single accommodations, personal items and alcoholic beverages—if possible, pack spirits in unbreakable containers. Spirits are welcome on Hondoo’s camping trail rides. You will need to bring your own favorite which can be safely carried into camp in the camp truck. Cocktails may be purchased at the local restaurants with meals on the Inn trail rides. Beer (3.2%) is available locally, however stronger spirits should be purchased prior to arrival. Utah has State operated liquor stores, the closest is in Bicknell, UT. 6 miles west of Torrey. Hours: Tuesday through Saturday, Noon until 7 PM. If you want to accompany someone on a trail ride but you are not a rider, you simply want to spend time camping and relaxing in a wilderness setting, or you want to hike this spectacular landscape, then you’re welcome to join a trail ride. Although the trips are designed for riders, it is not uncommon for participants to not ride one or more days. Daily guided hikes will venture forth as arranged. Non-riders may travel with the cook and campjack to and from the base-camp, however Hondoo and your travel consultant should know in advance. You should note that Hondoo Rivers and Trails guided a full schedule of multi-day hikes for over a decade, but now, hiking trips are outfitted only in conjunction with our scheduled trail rides. Hiking-only trips are outfitted on a charter basis.